If you haven’t been diving for a year or more, depending on your experience level, it may be necessary to complete a refresher course before your dive at Wolf Rock. This ensures you are well prepared to have a safe and great day of diving with us. Wolf Rock Dive offers refreshers for $100 which includes a theory and pool session taking around 3 hours, longer if you need more time. Purchase the manual from the shop in Rainbow Beach the day before the dive course (a lot of people that are traveling choose this option). Or, purchase the on-line version, complete the theory at home then a quick review on your day of diving. You pay PADI the fee and pay us the balance. Please note e-learning is not available for divemaster training with us. Sign up for e-learning on the PADI website by clicking this link. This is the option for diverse who are Open Water qualified and want to dive Wolf Rock, it allows us to safely take you deeper than 18 metres. The course comprises of 2 of the 5 Adventure Dives needed to become a PADI Advanced Diver – Deep Dive (compulsory) and one other (Boat, Fish identification or Naturalist dive are suitable) There is some home study that must be completed prior to the dives which is simply reading the relevant chapters and answering the knowledge reviews. The course includes PADI Adventures in Diving manual and instruction. After the dives we issue you with paperwork to confirm that you have completed these 2 dives, they will count towards the PADI Advanced qualification. 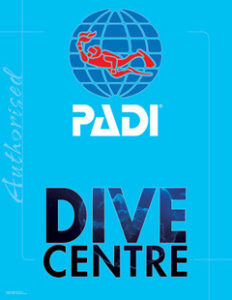 The other three dives can be finished anywhere in the world as long as it is with another PADI Instructor/Dive Centre. *Single adventure dives also available. Sign up for the Adventure Dives today! For the remaining three there are a multitude of dives to choose from, ask us for more information. Sign up for the PADI Advanced course today! The course covers a wide range of topics including, The Psychology of Rescue, Recognizing Diver Stress, Accident Management, Assisting Responsive and Unresponsive Divers at the Surface and Underwater, Equipment Problems, Oxygen Delivery Systems, Missing Diver Procedures, Responding to Diver Emergencies and In-water Rescue Breathing. Then, you’ll complete the in-water training portion of the course. Your instructor will have you complete ten rescue exercises in open water, either with or without initial skills practice in confined water. Finally, you participate in two Rescue Diver Scenarios in open water. Please contact us for course pricing. 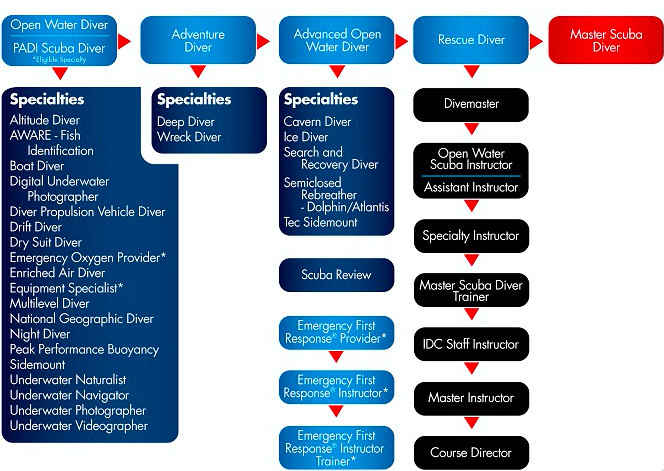 The Divemaster course is the first step into the professional diving industry. Consisting of dive theory, pool skill sessions, personal diving development and practical application, this course is designed to immerse you within the professional Divemaster role. We offer this as a 3-4 month internship where you are trained whilst working within our small dive team. Prior to enrolling in PADI Divemaster you must be at least 18 years old, have a current medical attesting to your diving fitness signed by a physician within the previous 12 months, and be a certified Advanced Open Water Diver and Rescue diver. You must also have completed an Emergency First Response (EFR) Primary and Secondary Care course (or other sanctioned first aid and CPR course) within the past 24 months and be able to prove that you have completed at least 40 dives to start (60 before being able to complete the Divemaster course with experience of deep dives, night dives and underwater navigation). If you have any questions as to whether you meet the necessary prerequisites and for course pricing. The lure of the deep: It’s a rare diver that hasn’t felt the urge to dive deep. There’s something exciting and mysterious about exploring deeper dive sites while scuba diving. Sometimes it’s a wreck that attracts you below 18 metres, and on wall dives it may be a giant fan or sponge. As a rule, divers tend to be adventurous people, and deep diving can certainly be called that! Whether to see sharks, take photos, or explore different reefs; whatever it is, to scuba dive with confidence at depths down to 40 metres, you should take the PADI Deep Diver Specialty course. Love sharks? Scared of sharks? Or do you just want to know more about them? Enrol in an AWARE Shark Conservation Specialty course and discover the value of sharks to marine ecosystems and economies. You’ll learn more about the causes of declining shark populations and the actions you can take to become a knowledgeable and passionate shark defender. By being informed, you can dispel misconceptions and act to protect sharks. Sharks need you! The AWARE Shark Conservation speciality course can be completed as both a ‘wet’ and a ‘dry’ course. Drift diving is a relaxing and enjoyable form of diving that offers an alternative to using lines and other techniques to move against strong currents. The PADI Drift Diver Specialty course teaches you how to enjoy going with the flow as you use ocean currents to glide along. It feels like flying – except that you’re underwater using scuba equipment. Drift diving can be relaxing and exhilarating at the same time. If this sounds like fun, then the Drift Diver course is for you. Side-mount diving is not a new concept, but its application has spread from cave diving to open water recreational diving. As we all know, having scuba tanks on your back isn’t a requirement for exploring the underwater world. Many scuba divers have discovered the joy of mounting cylinders on their sides. Side-mount diving gives you flexibility and streamlining options and presents you with a different approach to equipment configuration and a new set of skills to master. Plus, you don’t have to walk with heavy cylinders on your back – just enter the water, clip them on and go. Sound interesting? Sign up for the PADI Side-mount Diver Specialty course today! Prerequisites apply, contact us for more information.